The Tiger Moth, first introduced in 1931, became one of the most popular training aircraft in the world. It was used by the R.A.F. until the end of WWII. Virtually, all of the service pilots receiving their first flying instruction on this machine. As well as being used by the R.A.F. and many foreign forces, the Tiger Moth was employed by most of the flying clubs, and a great many are still in constant use for initial training and aerobatics. The Tiger Moth was powered by a 130 h.p. D.H. Gypsy Major engine, giving it a top speed of 105 m.p.h. and a range of 300 miles. Its wing span was 24 ft. 4 ins. and its length was 23 ft. 11 ins. 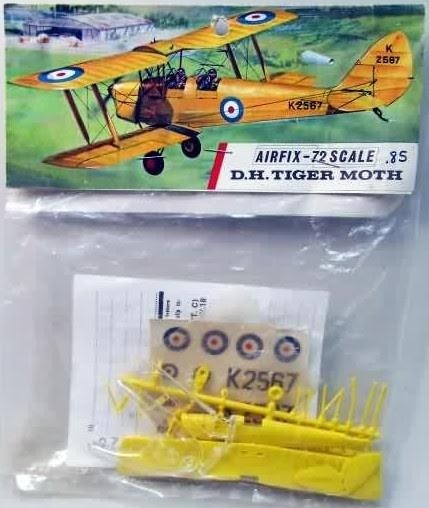 Airfix is an old prolific model company based in the U.K. 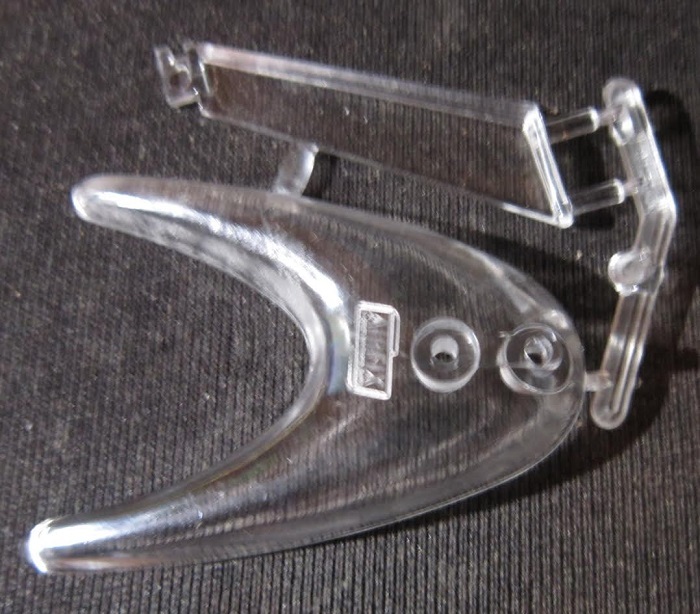 They manufacture all manner of model subjects in the popular scales. 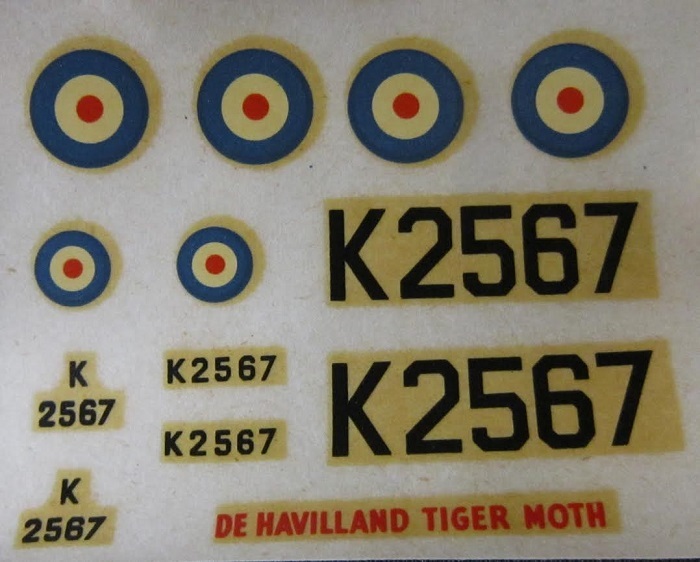 This kit has a copyright date of 1962 and was also sold in a cello bag in 1963, That same year Airfix re-issued the kit in a box and it appeared in a box 8 times up until 1993. The cello bag is held shut with a header sheet that is stapled to the top of the bag to hold it shut. This header sheet is also the kits instructions. ​Next are the two loose upper and lower wings and fuselage halves all in bright yellow. 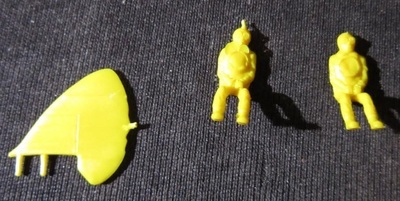 The rudder and 2 pilot figures complete the yellow parts. ​The clear tree holds 2 parts of the display stand. ​The decal sheet has a frosted sheet provided for it to protect its face from scratching. However, the sheet was floating around loose in the bag and not protecting a darn thing. I stapled it to the decal sheet. Unfortunately Airfix did not provide the 2 clear windshields needed. Parts have no number tabs next to them on the trees either. Bad moves Airfix. Flaps and rudder fin are molded solid. Panel lines are of the raised variety. The cockpit has no interior detail. You just glue the two figures to planks extending from one wall of the fuselage...sigh. The instructions which also serve as the header sheet consists of a single sheet folded in the center into 4 pages in 7" x 6 1/2" page format folded a second time to fit the top of the cello bag. Page one has the artwork and history of the Tiger Moth. Spread across page 2 and 3 are 3 assembly steps. Each are accompanied by text that walks you through the builds. Page 4 gives a 3-view of the cover art subject. This kit will make up nice in the right hands. I don't like to do the rigging cables on biplane kits. So, will never build this kit. I paid a whole dollar for this kit at my local hobby shop years ago and am more than happy to sell it for a decent offer.